and is able to see and speak to the usually invisible Good Folk. This makes her highly sought after by the King of Alban, who captures people with such skills and uses them for entertainment in the court, and for spying on the enemy. One of King Alban's Enforcers, Flint, tracks down Neryn, who, under his guidance and protection, leads her towards Shadowfell. But is he friend or foe? 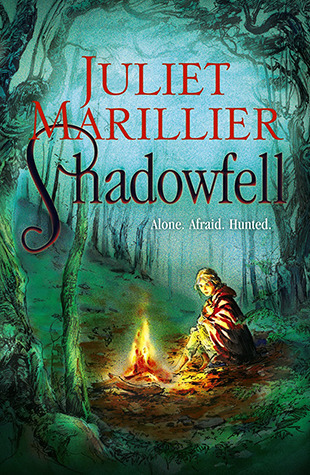 This is a quick read of Marillier's, a book written primarily for young adults, and yet not teenagery like many of the popular series, such as The Mortal Instruments by Cassandra Clare. This book bascially follows the journey of Neryn and Flint, and details how they survive in the terrain, but I found, apart from Neryn's talent to call on rock formations for help, there was really nothing new here for fantasy readers. It was a good read, but not a spectacular read. I will read the other books in the series as they are published, as I do enjoy Marillier's writing style, but it does not make my list of all-time favourite books. Popping over to Sheila's blog now, to see what my other bookish friends are reading! Visiting from the link-up, hope you enjoy your reading more this week! Happy reading! Janet Marillier is on my stack. I haven't had a chance to start the books I have though. Come see my Monday Report. Happy reading! I haven't read that one. But I do love Marillier's books. At the moment I am reading Pillars of the Earth by Ken Follett. I haven't read any of his books before and I'm about 80 pages in, it's going okay but I'm not gripped yet. 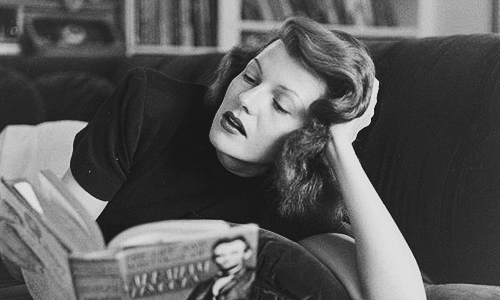 I love your Rita Hayworth pic! Do you get your pictures from Awesome People Reading? It's such a fun site.